The boards web part displays information from a single list selected in the current site in a Kanban type display. To move a card from one column to another, select the card and drag it to the next column. To edit a card's item, double-click on the card and the item will open in edit mode. To collapse a column, and see the number of cards in the column, click on the column heading's chevron icon. Tip! If you need to refresh the data in a Board, you can do it by using the Ribbon action. When you click the report information icon in the title, a popup shows the details of the current board. Details include: the report title, the type of report, the list used, the view selected, and the list column used to represent the board columns. All web parts share basic modification functionality - click here to learn about this. Modification options specific to the Board web part are addressed below. Click in the title of the Board web part to expose the ribbon. Click the Board tab and then click Configure List Board Settings. Select the list you want to use. Only lists with 'Choice' columns will be available to select. The ordering of cards in a column depends on the Filter selected. If 'All items in this list' is selected, then sorting is based on 'Title'. If 'All items in this view' is selected, then sorting is determined by the view selected. If the view selected is not sorted then 'Title' is used. If 'Specify filter (CAML)' is selected, then sorting is based on 'Title'. Select a list Choice column. Only single-value Choice columns are supported currently. If you are using the option with choice columns that allows 'Fill-in' choices then values added not in the default list will not be available to the board. You must select a card title. This is typically the item's title but can be any 'Single line of text' item. Select any 'People or Group' column to display, or leave this option blank. Select to show the percent complete value and a progress bar. Select any 'Date or Time' column to display, or leave this option blank. 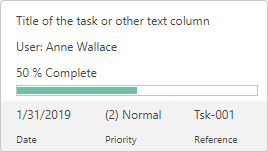 Tasks: the task is not 'Completed' and the date value shown is less than today. The specific tasks list in this case is of type 107. BrightWork Lists: for BrightWork specific lists like; Project Issues, Project Change Requests, Projects Risks, Projects Tracker, etc. if the Completed Flag is 'No' and the date value shown is less than today. Other list types: the date value shown is less than today. Highly priority items display in red if the Priority value contains a '1'. Select a Reference or Id column to display, or leave this option blank. If you select any of; Date, Priority, or Reference then the bottom row of the card will appear. If options are not selected then the space on the card will be allocated but the space will be empty. The 'Refresh Board' option refreshes the board every time a card is moved to a new column. This may be useful if data displayed on the card changes as the result of the move. For example, a task's % Complete changes if moved from 'Not Started' to 'In Progress' and refreshing the board will show the change. Select a theme to change the look of your board. To preview themes, select a theme from the Theme drop-down menu and preview your selection under Theme Preview. Note: Selecting different themes for different Board web parts on the same page is not supported. Only one theme will be used throughout in this scenario. Tip! Custom versions of web parts can be reused across a site collection by adding them to the web part gallery. Board web parts support three types of Chrome Type. As a result, changes made using the SharePoint Edit Web Part tool pane to the Chrome Type may not act as expected. Chrome Type should only be set to one of the following; Default, Title and Border, or Title Only. (See Web Part Settings above). Selecting either 'None' or 'Border Only' will cause the web part to display using the 'Default' setting. It is worth noting that 'Title Only' still appears with a border, albeit a thinner one. This is because the board itself shows a border, as distinct from the web part that displays it. Height values set in the web part's tool pane, in the Appearance section, are not saved. The board will automatically adjust the height based on the data it contains. SharePoint Permissions are supported, no access means no cards are displayed. Moving a card updates the card's data, so edit access is required to drag and drop cards. Double clicking a card to open it will open it in edit mode if you have the permissions to edit the item. Double clicking a card to open it will open it in read mode if you only have the permissions to read the item. Collapsed columns do not show their name if no data exists in the board. In the unlikely event of there being no 'Title' column in the list selected, then the first 'Single line of text' column is used instead. Only lists with a choice column are available to select in a board. However some lists are always excluded namely: Scheduled Report Emails, and all the caches.